Here's a great recipe when you want the flavors of gumbo in a portable package! 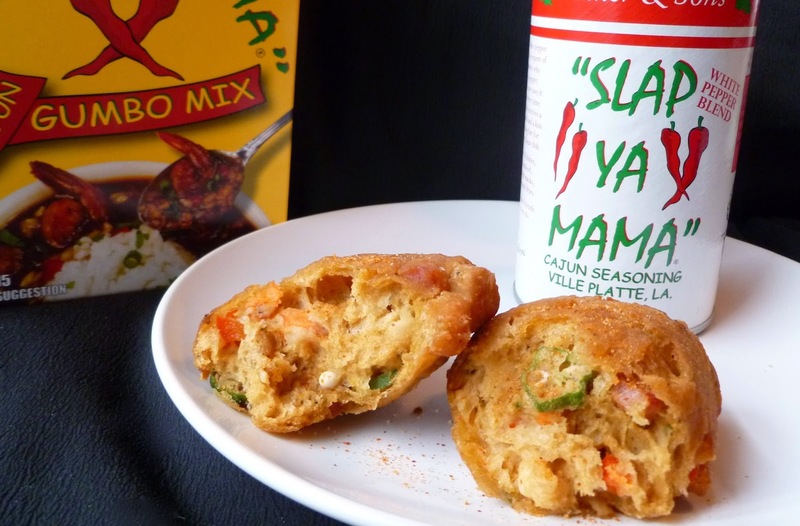 These savory beignets use Slap Ya Mama Cajun Gumbo Dinner Mix to make a tasty but light dough. Add in some okra, red pepper, shrimp, and andouille, and you've got a perfect passable gumbo appetizer. Enjoy! Mix yeast, warm water, and sugar in a medium bowl. Let sit 5 minutes, then whisk in vegetable oil and egg. Whisk flour, Slap Ya Mama Gumbo mix and sugar in a separate small bowl. Add flour to yeast mixture and stir until combined. Stir in shrimp, okra, andouille, and red pepper. Cover bowl with plastic wrap and let mixture rise in refrigerator for 1-2 hours. Scoop dough onto a well-floured board and pat into a 13 x 9-inch rectangle. Cut into 12 squares with a pastry cutter or pizza wheel. Fry squares, 1 or 2 at a time, in 350°F oil about 3 minutes per side or until golden brown. Sprinkle with Slap Ya Mama White Pepper Blend seasoning while hot.